Ostrich fern fiddlehead season is generally no more than two weeks so many people want to know how to preserve fiddleheads (Matteuccia struthiopteris) for later use. Learning how to preserve this springtime vegetable will be a way to enjoy its flavour throughout the year. Always remember when you are working with fiddleheads, never eat them raw! Fiddleheads can be cleaned by first placing them in a colander and thoroughly rinsing the them with clean, cold potable water. Submerging the rinsed fiddleheads in a bowl of clean, cool potable water should follow rinsing to remove the remainder of the brown sheath coverings, and repeat as needed. For short-term storage you must keep fiddleheads refrigerated until you are ready to cook or preserve them. They can be stored in the refrigerator, but should be consumed or preserved within a week or less for best quality. Once you have properly cleaned your fiddleheads they can be safely cooked either by boiling or steaming. Sautéing and stir-frying ostrich fern fiddleheads are NOT recommended methods. Fiddleheads should be boiled or steamed prior to use in other recipes that call for sautéing, stir-frying or baking. Bring a small amount of water to a boil preferably under a stainless-steel, vegetable steamer in a saucepan. Add cleaned fiddleheads and steam for 10 to 12 minutes with a lid covering the steamer and saucepan. After boiling or steaming, serve at once with optional toppings or seasonings, such as melted butter, vinegar, olive oil, salt, pepper and any other spices you enjoy. Cooked and rapidly chilled fiddleheads can be also served as a salad with an onion and vinegar dressing. Blanch small batches at a time by adding clean fiddleheads to potable water and boil for 2 minutes. The blanch time starts when the water comes to a rolling boil with the fiddleheads added. If the fiddleheads are packed too tightly, they won’t cook properly. Drip dry fiddleheads in a colander (or spin dry in a salad spinner), then place fiddleheads into moisture and vapour-proof, freezer-grade containers or re-sealable plastic freezer bags. Do not over fill bags or containers. When using frozen fiddleheads, thaw in the refrigerator or submerge the containers or bags in cold water until thawed, and then cook the fiddleheads using one of the methods above. 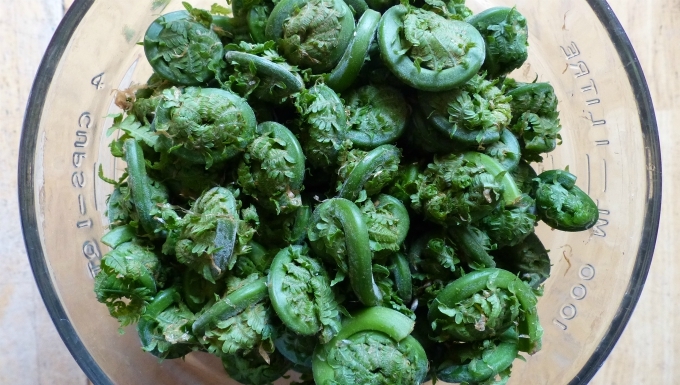 Frozen fiddleheads can be immediately cooked without thawing. Be sure to read Fiddlehead Safety to protect yourself from making any mistakes. Another recommended read is How to Harvest Fiddleheads.